You'll be £21.00 closer to your next £10.00 credit when you purchase Bugatti Blue. What's this? The British have had an affair with Bugatti for decades and perhaps Prescott Hill-Climb in Gloucestershire is the place where that relationship has reached its highlights across the decades. This collection of photographic images captures the brilliance of Bugatti design amid Bugatti blue at Prescott's wonderful natural amphitheatre in the Cotswolds – to which visitors, Bugatti owners, enthusiasts and addicts have travelled from all over the world to gather and to race up the hill. The author has spent years around old cars, often visiting Prescott and its home to the Bugatti Owners Club – which itself celebrates the 80th anniversary of its base at Prescott in 2018 and, the Club’s own 90th anniversary in 2019. Good for lovers of classic cars in action. You can almost hear those exhausts…. 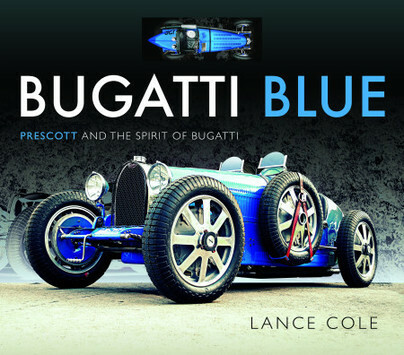 Author Lance Cole is obviously a huge fan of the different types of Bugatti and his enthusiasm spills over into every page of this praiseworthy volume the effectively encompasses the special relationship between machine and location. This would make a great gift idea for any Bugatti or classic car fan. It’s a big thumbs up for me, and makes me want a Bugatti (one day maybe) all the more. Set in the tranquil Cotswoldd countryside, Prescott Hill Climb has become the home of Bugatti in Britain. In this book, author Lance Cole has captured the spirit and beauty of the cars and location combined. As a classic enthusiast, it’s difficult to find any dislikes. The book is clear, concise and accurate, with a strict emphasis on delivering a great photographic experience to the reader, accompanied by an essential but less intrusive narrative. This book will surely put Prescott, especially the “jewel in the crown” event each August, on your bucket list.